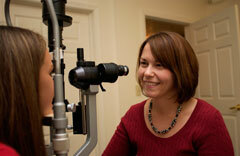 At North Country Vision Center we offer convenient and personalized contact lens fittings. Our staff consists of doctors of optometry as well as a certified contact lens practitioner to make sure you are fit properly. We offer lenses made by known manufacturers as well as custom fit lenses that are never “off the shelf” correcting for astigmatism. Want to SAVE $$ on your contact lens supply? We offer mail in rebates as well as discounted pricing on annual supplies! Order your lenses now. Avoid rubbing your eyes when your contacts are in. Lubricate your contacts with rewetting drops if needed. Always keep a pair of eyeglasses on hand with your current prescription. To protect your eyes, wear sunglasses with full UV protection. Call your eye doctor immediately if you experience severe redness, itching, or blurry vision.